Ever wanted to swim in a lake? A salt water lake lake near the sea, on an island? Or have you ever wanted to watch dolphins from a 160m high cliff? Or see an island shaped like a plate in the middle of the sea? This and much more you can experience in Nature Park Telascica. Ever wanted to swim in a lake? A salt water lake lake near the sea, on an island? Or have you ever wanted to watch dolphins from a 160m high cliff? Or see an island shaped like a plate in the middle of the sea. This and much more you can experience in Nature Park Telascica. The cove from which the nature park got its name is one of the most protected ports on the Adriatic. It is indrawn for 8 kilometers into the land, while the cove has 6 little islands. The most known is Taljurić, which looks like a plate. The straight surface of this inslet is just 60 meters in diameter and will thrill visitors. When you decide to get out from the cove, you're in for a treat because you'll be sailing towards the National Park Kornati archipelago. One of the rarest salt lakes in Europe is placed in Telašćica. The Mir lake is filled with salt water through numerous underground cracks. The temperature of the lake can reach up to 33 ºC. The lake being very salty, there's no diverse animal and plant life. But one can find healing mud on the southeast side of the lake. Huge cliffs, also known as the Stene of Dugi Otok, are rising on the outer side of the cove. The highest peak is 160 meters, and can be up to 85 meters deep in the sea. The rare red coral lives in the depths. From these cliffs one can also watch dolphins or the flight of the grey hawk. How to get to Telašćica? The best way to get there is by boat. 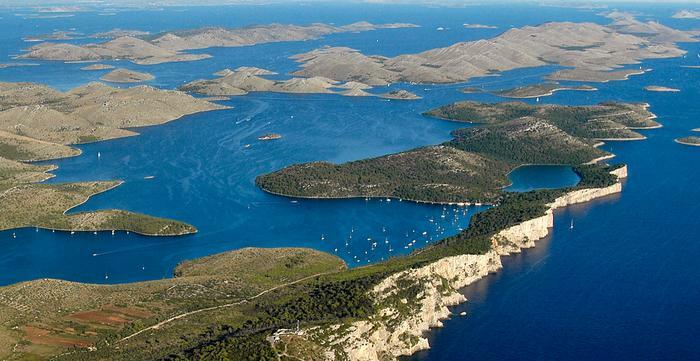 If not by your own boat, one can find the best transport and routes to Telašćica in Sali on Dugi Otok. Although it's not a part of Telašćica, it would be a shame if you missed the heavenly beach Sakarun. This 800 meter long beach with white sand is a real rarity on the other wise pebble and stone Adriatic coast.